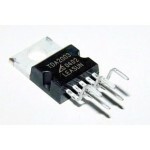 Purchase online TDA2030 Audio Amplifier Module in India at low price from DNA Technology, Nashik. Want to increase the audio output capability of your project? Well then this is the perfect module for you. This module is based on famous TDA2030 Audio Amplifier Module which is capable of 18 watt power output with very low harmonic distortion. TDA2030 Hi-Fi Audio AmplifierThe UTC TDA2030 is a monolithic audio power amplifier integrated circui..
MAX9814 Microphone AGC Amplifier ModuleThe MAX9814 is a low cost, high performance microphone amplif..